Installing a breaker can be a simple process if you know your way around a circuit panel. However, if you are uncertain of your talents, be sure to switch the main breaker to the off position. This is usually located at the top of the breaker box or circuit panel. Even then, it is a good practice to handle the wires with care. This will help you in the future to use caution whenever you are working with electricity. Not all breaker boxes are built alike, so be certain that the new breaker is designed for the particular breaker box to your house. In addition, all breakers will not fit the same, some will require the breaker be pulled out from the side where the wire is secured to it, while others may not. Locate the main breaker that feeds the electricity to the breaker box. Switch it to the OFF position. Never work with live electricity. Locate the faulty breaker and grip it firmly. Depending on the brand of your breaker, pull up from the side of the breaker where the wires are connected to it, or from the center. Lift it out of the breaker box. 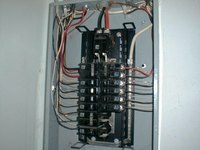 Be certain that it is clear of the other breakers before removing the wires from it to prevent damaging other wires. Locate the screw that is holding the wire to the breaker and loosen it. Remove the wire and discard the faulty breaker. Strip away some of the wire insulation if needed. Insert the wire into the new breaker. Tighten the screw down tight to ensure it is secure and won’t slip out. Make sure that the bare wire secured to the breaker does not make contact anywhere else. Insert the breaker into the middle section of the main box, depending on the brand. Push in the side of the breaker that the wire is on until it is snug. Switch the main breaker to the ON position. If the new breaker trips when power is restored to the breaker box, switch the main breaker to the OFF position and check the connection to the new breaker. You will not have to force the breaker into place. If it will not go in, be certain there is nothing hindering it from installation. Wear gloves to protect your fingers. Only use the wire strippers if the exposed wire is not exposed enough to make contact with the new breaker.